Perfect for anyone who wants a comprehensive but brief and reliable commentary on the entire Bible. Ideal for personal Bible study. The Bible Knowledge Commentary is for everyone who wants a comprehensive but brief and reliable commentary on the entire Bible. It is based on the New International Version of the Bible, making it an excellent tool for personal Bible study. And it presents fresh insights into the Scriptures that are helpful for both advanced and beginning Bible students. In their comments on the biblical text, the writers discuss how the purpose of the book unfolds, how each part fits with the whole and what precedes and follows it. As you use this commentary, you'll be able to see why the biblical authors chose the material they did as their words were guided by the Holy Spirit's inspiration. You'll also find clear discussions of problem passages, puzzling Bible-time customs and alleged contradictions. Many Hebrew, Aramaic and Greek words, important to the understanding of certain passages, are discussed. These words are transliterated for the benefit of readers not proficient in the biblical languages. And of course, with PC Study Bible, you'll be able to click on these transliterations to conveniently view Strong's definitions for any word. • Insightful commentary that summarizes an entire section of the text for you, followed by detailed verse-by-verse (and often phrase-by-phrase) comments on the passage for the New Testament. For the Old Testament, you get passage-by-passage (and often verse-by-verse) comments. The Bible Knowledge Commentary is written by faculty members of one school — Dallas Theological Seminary (DTS). DTS is noted for its commitment to the inerrancy of the Scriptures, dispensational theology, and biblical preaching and teaching. Their commentary interprets the Scriptures consistently from the grammatical-historical approach and from the pretribulational, premillenial perspective, for which DTS is so well known. At the same time, the authors often present various views of passages where differences of opinion exist within evangelical scholarship. 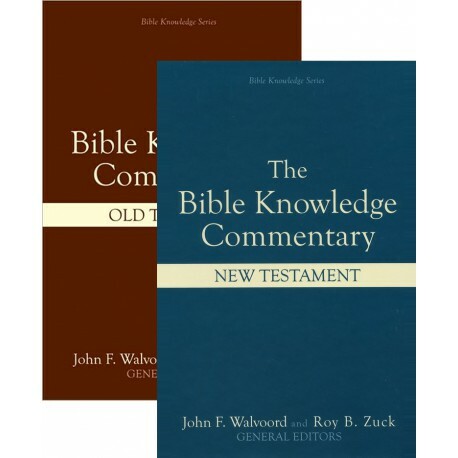 Both volumes were edited by John F. Walvoord and Roy B. Zuck with consulting editors Kenneth L. Barker, Eugene H. Merrill and Stanley D. Toussaint. Contributors include Gene A. Getz, J. Dwight Pentecost, John D. Hannah and other noted Bible scholars.